Super Hero Boy: Really their candles are smart! Really their candles are smart! I did a review back in July about the Jellephish lamp from Smart Candle and wow have we ever really enjoyed that lamp. Connor sleeps every night with it set on the blue setting and though it actually does light up his room fairly brightly there is something soothing about the blue light and the moment I turn he lays down and tends to settle down. I guess its just become part of our lives. Well I recently discovered that candles, at least the traditional kind, are a huge "no no" in this household. Connor is a climber and thus far if he really wants something there is just no stopping him from getting to it. Unfortunately for him he inherited his mothers obsession for anything that glows, this includes candles. Sadly he has yet to realize that touching burning candles may not be the best idea ever as well, though I admit I have done it myself on one too many occasions. Either way it doesn't feel good and we really do not want any burnt fingers, faces, or clothing around here so we are on a temporary candle ban. Not to mention have you ever noticed just how warm your house gets if you burn a few candles for an hour or two. I lost power a few weeks ago and I lifted the candle ban while Connor slept and lit some candles for light and lets just say middle of July, no power, candles burning, no air conditioning or fans, the house quickly rose to a toasty 95 degrees with the exception of Connor's room. You're most likely wondering why on earth Connor's room stayed so much cooler but yet was still lit. Easy, Smart Candles. Smart Candles are the perfect solution for those of you who love candles but for one reason or another cannot use them. Maybe its a weater issue, heat issue, kids, babies, pets, whatever, but I can guarantee to you that a Smart Candle will cause you no grief and you wont miss your real candles not even one second. Actually unless you look really close you and your guests may not even realize that the candles burning are not real. The offer the same glow and flickering action of a real candle and there are a range of different looks and candle heights so you can find one to match almost any holder. Smart Candles are basically battery operated candles. They come in several different options but my favorite is the pillar candles which come in a scented wax, yes I did say wax, shell or a silicon shell. Either way is great depending on what you need and they look just like real candles. I replaced the real candle centerpiece on my dining room table with a Smart Candle wax pillar and believe me no one was none the wiser. The best part is I can turn it on anytime I want and I never have to worry about Connor sticking his fingers in it or it getting knocked over. Not to mention with how sleep deprived I've been lately, its not an issue if I leave it on all night and it won't burn down the house either. heh. Worst case I run the batteries down and that's easy enough to fix. Along with the battery operated candles, Smart Candles come in a selection of rechargeable models. Let me just tell you know I would flip my lid to get a set of the rechargeable silicone candles. Seriously if you have a lady in your family that is a candle nut you really must check out the four candle rechargeable set. Not only is that completely rad, but its environmentally friendly too! If you know someone that runs a restaurant or are planning a wedding all of the smart candle rechargeable are available in commercial bundles as well, meaning you can buy a set of 12 or more candles to reuse as many times as you'd like. They come in tea light sizes as well. Could you imagine how cool it would be to have a whole room of tables lit with rechargeable candles. So many restaurants shy away from candles now, but these candles are totally safe for guests as well. Smart Candles are available for purchase directly from their website! I have a tealight gift set to give away to one lucky reader! Leave a comment on this post. Check out Smart Candles and tell me which Smart Candle is your favorite and why you'd love to have one! The Party Lite is my favorite. The simplicity of the light appeals to me primarily because I can picture myself using in the bathroom while taking a nice bubble bath. I love the idea of a battery operated candle, I am always worried about burning candles, and the harm that can be caused by them. I like the JellePhish Mood Lamp that you reviewed earlier. It would be great for my son who is very afraid of the dark and is having a hard time sleeping in his room alone. It is a bit pricey for me though. I also really like the Smart Candle Rechargeable Ivory/Vanilla Wax Pillar 2 pack Set. I'd use them in my living room. I love candles but don't light them often because 1)I have small chilren and 2)it's too hot here in Florida. I would love to get the Rechargeable 2pk Gift Set for my mother-in-law. She lights a candle every night for her son who passed away 2 and half years ago. This would save her a lot of money in buying candles! I love the rechargeable candles and would use them as night lights in my house!Such a neat idea! I linked to you on my Giveaway Blog, too. I'd love to win, because I will light candles the first day of school when the house is finally empty. I'd love to win, I like the Smart Candle Rechargeable Ivory/Vanilla Wax Pillar 2pk Set. I really like the Smart Candle Rechargeable Ivory/Vanilla Wax Pillar 2pk Set. My favorite is the 9" Ivory Vanilla Wax Pillar. I always have a pillar candle lit when I am on the computer at night and get so afraid that I will fall asleep with it lit! These candles are a PERFECT alternative -- and will be safe around my curious kitty-girls! Smart Candle Rechargeable Ivory/Vanilla Wax Pillar 2pk Set would be something I would pick out to start out, I also like the Jellephish lamp, but wow the price is pretty steep! I have also blogged about this giveaway! I want to win since I really enjoy candles and they totally go with my apartment. These battery operated ones are cool. My favorite smart candle is the 7" Ivory Vanilla Wax Pillar. I like the rechargeable ivory/vanilla pillar Smart Candle the best. My son won't let me use regular candles. I guess he has had a fire safety course at school. I've never had one of these candles but thing it would be a great thing to have. Thanks. I love the idea of these candles. What a great and safe idea. I love that there is no real flame. My favorite is the Platinum rechargable candles. Thanks so much for this giveaway. I have seen a few of these before but these look like something I would trust and actually buy, meaning these don't look cheap or cheesy!!! I really like the Hollowick Amber Panel Holder. Might just go on my christmas list! I like the rechargeable candles. These are great and so much safer than open flames. love the Platinum Rechargeable 12pk Set, what a great idea! I really like the 10" Ivory Silicone Formal Taper 2pk . I love how taper candles look on the dining table, but am so afraid they are going to tip over or something and burn the place down. I like the rechargable votive set! They would be so much safer than flame candles! I like the Jellephish mood lamp. these would be great. Thanks! The hippie in me LOVES the Jellephish Mood Lamp! I like the light fusion, so pretty. JellePhish Mood Lamp. I love it because my daughter would flip over it! I like the ivory/vanilla rechargeable pillar gift set. I also like the vintage candles. The reason I'd love to have one is because I've basically stopped buying regular candles for safety reasons from both the smoke and the chance of fire. These candles take away those concerns! I like the Rechargeable 2pk Gift Set (SCR341). These look great! I have two toddlers that like to know things over and a teenager who like to light candles in her room only to fall asleep. I like the Platinum Rechargeable 12 pack set. I like the JellePhish Mood Lamp (SCLFJPHISH). I would enjoy having this in the spare bedroom for my grandchildren when they spend the night. It would be a safer alternative to other lamps. I am totally addicted to candles. My favorite smart candle is the 7" Ivory Vanilla Wax Pillar. I like the simplicity of these. I also like the fact that they are safe if forgotten while running out to the store. Hollowick Diamond Panel Holder (SCH1201) 6 Pack are gorgeous! I'd love to have these, with a son and another one on the way they are way safer than regular candles! WoW the LiteFuzion is too cool~! We are currently finishing the Jam room since we have 3 guitarist, 1drummer and 1 trumpet player in the house and with all the equipment we needed a Jam room desperately and these lites would look GREAT in our new Jam room. I am scared of fires so I don't like using them yet I love the glow they give so these are wonderful~! This site was awesome thanks for having this great giveaway! 5" Ivory/Vanilla Wax Pillar (SC3875) is my favorite. I feel that they are safer to use, especially around children and pets. I'm totally dreaming here but I just love the LiteFuzion 5 Spike Ic Chandelier. Unfortunately I don't have $1200 to spend on a light. We're building a new house and I'm totally going funky. This would be perfect! I'd take a regular candle too, though! Thanks for the great contest! I love the idea of candles with no dangerous flame that you can have around children. I would love to have the Smart Candle Rechargeable Ivory/Vanilla Wax Pillar 2 pk. Set since I love the scent of vanilla. I really like the Hollowick Panel Holder Series. I like candles period because they are relaxing. I like these in particular because they aren't real flames! I really like the Jellephish and the Party Lite. I'd like to have one because they are very safe and rechargeable. Such a neat idea. Thanks so much for the opportunity. is my favorite, I love the calming effect it has on you. Thank you for having this. These are just fantastic. Thank you! I would choose the Smart Candle Rechargeable Ivory/Vanilla Wax Pillar. Thank you! I like the Party Lite. I think they are a great idea! 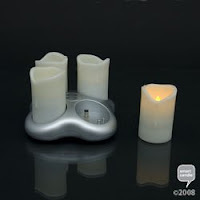 I love the Rechargeable Candles, they are such a neat idea and would truly save alot of money! Thanks so much for a great opportunity! I love candles and during fall and winter I light them everyday! The 7" Ivory candle. But I really like the JellyPhish mood lamp. I think it's cool. My husband and I enjoy any sort of candles. We really like the smelly candles. We just worry about the cats getting their tales in the candle. So we put them up high. I like the 5" Ivory/Vanilla Wax Pillar. This is such a GOOD idea. My kids are older & I thought it would be okay to have candles lit if I kept them on the stove. I was doing something in the kitchen & forgot about the candle & my hair caught on fire! I have one of these and I love it. I like the Smart Candle Rechargeable Ivory/Vanilla Wax Pillar 2pk Set. I'm a teacher and we love these for our classrooms since we can't have real candles anymore. the Rechargeable 2pk Gift Set is the one! The pleasure of candles without the worry! I love the red JellePhish Mood Lamp. It is stylish and unique. Love teh rechargeable candles, what a great idea. I love the idea of the Platinum Rechargeable 12pk Set it would be perfect for all my ceramic pieces that need lights. JellePhish Mood Lamp for my teenager. I won't let her light candles in her room and she would love this. i would pick the Smart Candle Rechargeable Ivory/Vanilla Wax Pillar 2pk Set . these are so great when you have little ones around! I like the commercial Platinum Rechargeable Silicone Ivory Candles. They'd look great in my store! my favorite is the "Ivory Vanilla Wax Votive", i would love this, i bet i could fool alot of people to think they are real! Wow that JellePhish Mood Lamp is really cool! As for the candles I like the idea that they are flameless! No worries about my children attempting to burn my house down! I like the blue frosted glass one. The color is so pretty! My favorite is the Smart Candle Rechargeable Ivory/Vanilla Wax Pillar 2pk Set because it looks so real and is scented and rechargeable. My favorite smart candle is the 7" Ivory Vanilla Wax Pillar! Thanks for the chance to win this great prize! I love love love the ice chandelier!! My favorite is the "Smart Candle Rechargeable Ivory/Vanilla Wax Pillar 2pk Set"! Thanks! JellePhish Mood Lamp..it's so unique and beautiful! I love the Liquid Water Feature product. It looks very cool. These are fantastic! So much safer and truly beautiful. My favorite is the Smart Candle Rechargeable Ivory/Vanilla Wax Pillar 2pk Set. Thank you so much! I like the Smart Candle Rechargeable Ivory/Vanilla Wax Pillar. One of my cats caught his tail on fire with a lit candle once. I jumped up and put it out before he knew it. He had long fur. I haven't used candles since. I like the party lite candle and it would be so perfect for my two cats who have a habit of knocking things over with their tails. Wow, those LiteFuzion products are really something! But more in my price range, heh, I like the party lites. They'd be nice for grey winter days and of course during those pesky power outs! With the holidays coming around the corner I like the rechargeable 4pk Gift Set that would be perfect for the Holloween pumpkins. Smart Candle Rechargeable Ivory/Vanilla Wax Pillar 2pk Set is my favorite - would look lovely on my hall table!!! My favorite candles are the 5" Ivory/Vanilla Wax Pillars. I would love to own one because we have always loved the soft glow of candles in our home, but it has become increasingly difficult to light them because of our toddler. This would be perfect for our family! 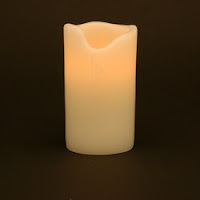 I love the vanilla wax votive 2 pack battery candles. I love this because I love candles but am ever afraid of having a house fire. i like the rechargeable candles. The short candles are my favorite as it will be nice to make it safer at home. the ivory vanilla pillar ones look good to me! I love the Platinum Rechargeable 12pk Set but it's a little too pricey for me. I like all of the rechargeables - but battery operated are great too. I've seen some of these at restaurants and they are so realistic! I like the Bulk Party Lite!! Perfect for gatherings! I like the LiteFuzion candles. I like the Jellephish lamp! My favorite is the Medium Pillar W/ Timer. I think these are great because I they have the look of a real candle. I like candles but rarely have them around the house because I have a fear of one of them catching fire. I like the Smart Candle Rechargeable Ivory/Vanilla Wax Pillar. I love candles, but can't safely use them with 3 cats in the house. I would love to try this! The tealights are really cute. But I like the wax pillars too. I like the vanilla wax pillar candles because they look like the real thing but are safe! My oldest likes to light candles in her room and I constantly worry she's going to fall asleep with them lit. This would ease my mind completely. The Smart Candle Rechargeable Ivory/Vanilla Wax Pillar 2pk Set is my favorite! That jellyphish lamp is cool. I would like ANY of those candles because I try to have candles around and no matter how much I tell my kids, or threaten, they constantly blow them out. Also, it would be cool in my older daughter's room. I'm redoing it and it would be a more grown-up nite light! I love the Ivory Vanilla Wax Votive 2pk Set. I always would have candles burning, until my two cats decided to burn their whiskers off. Now I am afraid to burn my candles. This would be a great alternative. The rechargeable candles are a great idea. I like the rechargeable ivory/vanilla set. These are great. I love how much safer they are. I like the Liquid Water feature which shows flowing water and changing lights. What a calming item. I like the Smart Candle Rechargeable Ivory/Vanilla wax pillar. I love that you do not have to worry about leaving them on. Ok...SO I love candles but I am really absentminded. In the past few years I have actually left the house with candles still burning on several occasions. yikes. Now my roommates won't allow me to light them unless other people are around. Candles also give me allergies for some reason, so these smart candles would be PERFECT for me. I like the rechargeable ivory/vanilla pillar Smart Candle the best. /thanks for the giveaway! I love the rechargeable candles and would use them as night lights in my house! Ever since I charred a portion of floor by falling asleep with a candle burning, I'm slightly paranoid about candles in general -- but these sound quite beautiful and safe! Thanks for the chance! Reach me via gmail with flaredz0ne (that's a ZERO)! I suspect the tealight candles are the most flexible in terms of being able to fit them into almost any holder - we have some pottery items from Santa Fe that I couldn't put a real candle in (carbon black stains) but that would be awesome when illuminated from inside!! Thx! Let me know via gmail with d3addr0p (both odd ones are numeric), please!! I like the Original 4 pack. If I got too many, I'd just lose 'em. And I definitely want more than one! I like the Ivory Vanilla Wax Pillars. These candles are a great idea - I gave up on candles because of the dangers and the toxic fumes. Wow, what great candles! I like the Smart Candle Rechargeable Ivory/Vanilla Wax Pillar 2pk. I love putting something out when I've got guests over for the evening. Candle just make the room look nice, but always have to worry about the flame. Problem solved with these. Another thing for me to think about it hurricane season or even those afternoon thunderstors. We are always loosing power and it would be nice to have something like this on hand. these are really cool, and love all the chandilier.. Platinum Silicone Rechargeable Ivory are great. I like them because their is no danger of fire. I would love the Smart Candle Ivory Silicone Rechargeable 2pk Set for my 92 year young mother. It would be safe for her to use and she would not be worried about having to replace the batteries or having the batteries on hand. Thanks for such a useful giveaway! I'd have to go with the vintage look - my grandparents lived in the country when I was growing up, and I remember the big, stately homes with a single white light flickering in each of the front windows. It was warm, welcoming and beautiful. I'd love a set for our windows, too. These are so nice. I like the Rechargeable 4 pack gift set. This would be just enough to use at Halloween and during other special times. I heart the Smart Candle Rechargeable Ivory/Vanilla Wax Pillar 2pk Set. i hate candles, they freak me out, so this would be great! I like the Rechargeable Ivory/Vanilla Wax Pillars. I like that they don't leave soot, we have allergies. The Smart Candle Rechargeable Ivory/Vanilla Wax Pillar 2pk Set is my favorite. I would love to have one because I like the idea of having candles without worrying about something catching on fire.